It has been a long time coming – we have no illusions – we have a long and winding road ahead of us. However, we have experienced a wonderful breakthrough over the past couple of weeks. Ethan is responding to music and sounds. We always felt strongly that Ethan could hear, but how he processed what he heard was unknown. In the past two weeks we have seen Ethan get BIG smiles on his face when he hears familiar music. The music recognition started in Speech Therapy when they played Macklemore's "Thrift Shop." Ethan began to smile ear to ear and his eyes lit up! The therapist turned the music off and asked Ethan to close his eyes if he wanted to hear more of the song. After a long pause, Ethan closed his eyes. When the song began again, he expressed the same reaction. This continues today at home and in therapies when he hears familiar tunes. 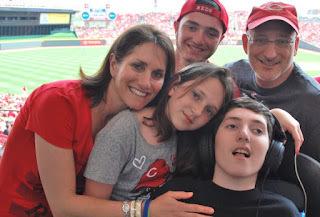 For Mother's Day, last weekend, we were offered an opportunity to take Ethan to the Cincinnati Reds Game. What a great time we had as a whole family. In fact, this was our first family outing together since Ethan's incident. This was no ordinary outing to a baseball game. A very kind donor offered a luxury box suite to Ethan so that he could experience the game with the comforts of both the indoors and outdoors with a private bathroom. Given Ethan's love of baseball, we could not have been more excited (and scared) for this to be his first outing. Ethan enjoyed every minute of the game – the smell of the place, the sound of the place and the WIN. However, it was the Seventh Inning Stretch that again reinforced our belief that Ethan is hearing and processing sound. During the singing of "Take Me Out To The Ball Game," Ethan's entire face lit up again – a smile from ear to ear and eyes bright and wide open!!! An experience we will never forget. As we continue in the middle of the spring of 2014, we look forward to more growth from Ethan over the coming weeks and months. 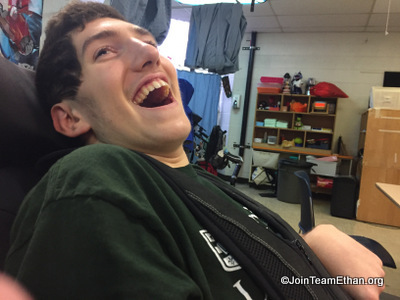 Given all of the complications Ethan has experienced over the past 10 months, he has not been given the luxury of time focused of rehabilitation. His energy has been distracted toward recovery from one surgery after another. Let the rehabilitation begin! This is a long and winding journey which we have said many times will take place on Ethan Time. It is wonderful to see Ethan have the strength to enjoy a baseball game and take in some of his favorite music. Experiencing joy is key – he is showing us he can do it. Looking forward to the next stop on the journey.